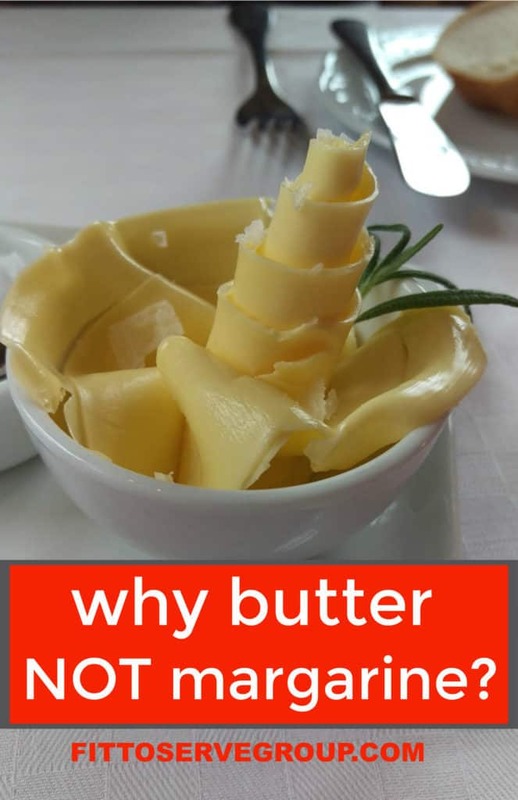 Do you know that despite what you may have heard, it is much better for your health to eat real butter versus margarine? In this post I will point to the reasons why. I grew up in a home where we all ate real butter. It was normal to see my parents fry their eggs in butter, and use it liberally. Because of this, as children we had no problem slathering it on our foods. Hmmm, why butter not margarine? Let’s trace back to its first arrival in my life. One day our beloved butter was replaced with a tub of margarine. My well-meaning mother, explained that what was in the plastic container was healthy. Even then I remember thinking this doesn’t taste the same, but at least it spreads easily. My dad however, didn’t take my mother’s advice and stayed faithful to butter. He left his butter on the kitchen table during the day allowing it to become spreadable. I can still remember my mom reprimanding him. “Pero Pablo, no comas tanta mantequilla”! Translation: Pablo don’t eat so much butter, it’s not good for you! Dad would roll his eyes, ignore her and enjoy his butter. Why butter not margarine? Well, dad wanted no part of the fake stuff. As teenager I tried to be compliant with mom’s insistence to use margarine, but I never liked the flavor. So I rebelled and began baking with my dad’s butter. Everyone enjoyed my baked goods. Of course they did, they were made with real butter! Here’s the thing, my papi is 80 years young and has never needed blood pressure medication, nor suffered from clogged arteries. My mami on the other hand, has taken medication for years to reduce hypertension and had to have a few stents put in her arteries to unclog them. For years we just attributed my dad’s good health to great genetics. Honestly, today I am not too sure his wonderful health can be chalked up only to great genes. Why butter not margarine? Well, when you consider that butter is all natural and easy for our bodies to identify, versus margarine a highly synthetic concoction, you are left wondering. Does it make sense to believe that a man-made, low-grade oil full of additives is healthy? 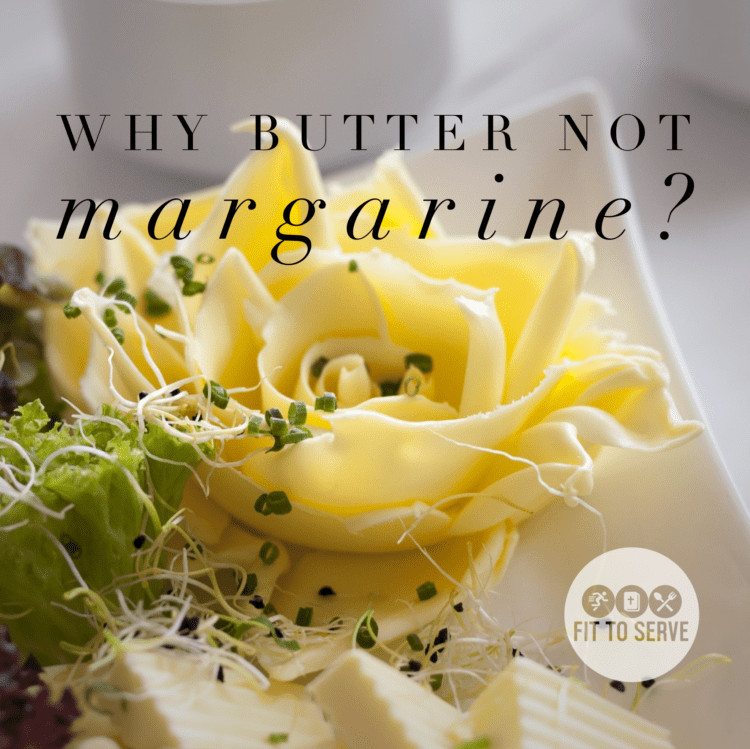 In an era where we are being encouraged to eat less processed foods, to avoid chemicals, the idea of margarine being a healthy choice just seems wrong. Not only does butter taste way better, it’s been eaten for centuries without health consequences. Made by the simple process of churning the fatty layer of cow’s milk, it’s a natural product. By contrast margarine is a highly processed food, full of emulsifiers, artificial colors and ingredients few of us can pronounce. Do you know that margarine isn’t actually yellow? That’s right, it’s actually an ugly shade of grey. I highly doubt anyone would be eating margarine if it didn’t have a heavy dose of colors and chemicals masking its true identity. What Really Is Margarine Anyway? Margarine’s main ingredient is vegetable oil, which is liquid at room temperature. In order to have a firmer consistency and longer shelf life it needs to go through the process of hydrogenation. Hydrogenation is what turns a liquid vegetable oil into trans fats. Yes you read right, the trans-fats proven to clog our arteries! It’s these dreaded trans-fats that contribute to heart disease, cancer, hormonal issues, infertility and learning disabilities in children. Am I the only one that sees something wrong with this picture? Perhaps you have not read the latest scientific research that assures us that we need not fear natural occurring fat. The fat in coconuts, dairy, and animal has been vilified unnecessarily. The days of thinking that saturated fats are bad for you are coming to an end. There is a growing shift in the scientific world indicating that natural saturated fats shouldn’t be feared, perhaps even embraced. You know what I think we really need to be concerned about? The so called government health advice in regards to heart disease, cholesterol levels and their plea to stop eating butter and other natural fats. For years we were told to embrace margarine and ban butter. Not only was it poor advice in my book, the truth is that margarine use can be detrimental to our health. Do you know that heart disease was rare in developed nations at the turn of the century? With the introduction of margarine came the rise of heart disease, as butter consumption dropped, so did our health. Makes you wonder huh? Still not convinced why butter not margarine? The following are just some of the reasons why I trust the cows more than the chemists and why I recommend you choose butter not margarine. Antioxidants: Shields the body from free-radical damage. Butyric acid: A short-chain fatty acid that supports colon health. Conjugated linoleic acids: CLAs help fight cancer, build muscle and boost our immunity. Iodine: Is key to our thyroid health. Vitamin D: Helps our body absorb calcium for strong bones, reduces our risk for osteoporosis, heart disease, and cancers. Lauric acid: A medium-chain fatty acid. It encourages the body’s immune system. Lecithin: Helps protects our cells from oxidation. Vitamin A: A key vitamin for eye and endocrine health. Vitamin K: Needed for proper blood clotting and bone health. Vitamin E: It’s anti-inflammatory properties help speed up wound healing, strengthen immunity. 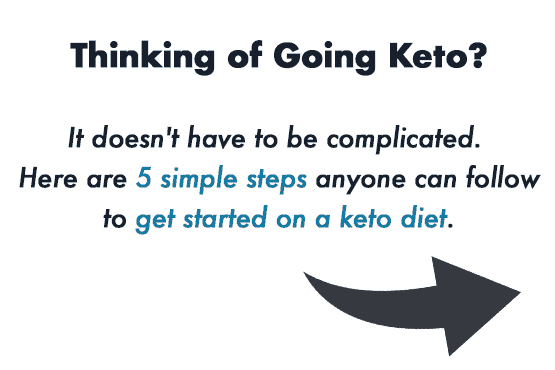 If like us you have made a low carb diet a way of eating, then you might want to stick around for my favorite ketosis tip. 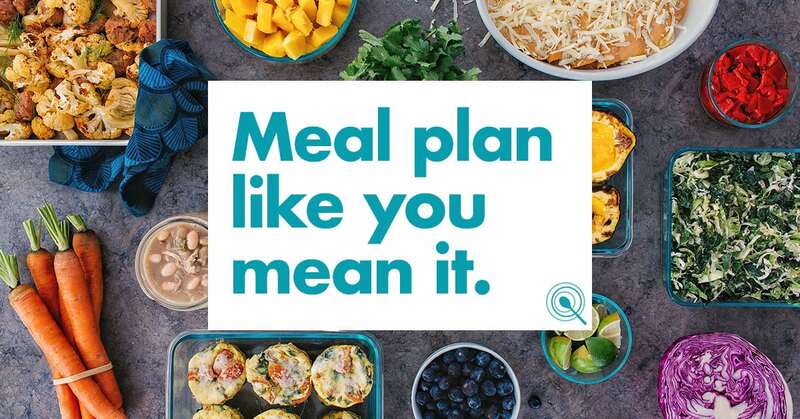 It’s the number one tip our Fittoserve Group Community Group is using and seeing consistent results with. What is this fantastic ketosis tip you speak of Hilda? Well, it’s the use of exogenous ketones. 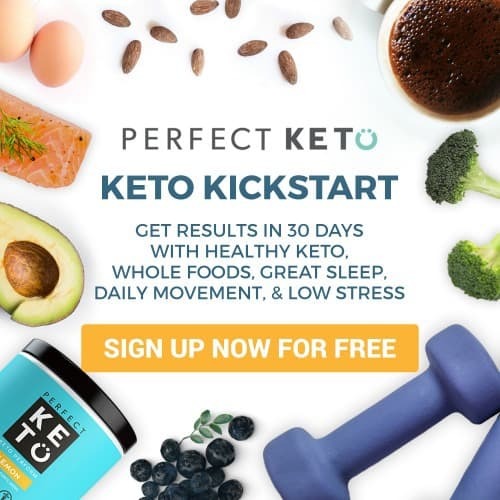 Perfect Keto allows you to drink your ketones and put’s you into a state of ketosis in under 59 minutes. Until now to get into a state of ketosis required days, perhaps weeks of very strict keto dieting. However, with the ability to now drink ketones you can see the results you want to accomplish consistently and quicker. You can now experience what it feels to be in ketosis and side pass the dreaded keto-flu. The flu-like symptoms you experience when transitioning into a ketogenic state. 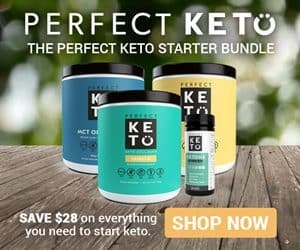 Having Perfect Keto is like having a test-drive of the ketogenic diet. You can understand what it feels like to be in ketosis and experience the many benefits. Do know that when you choose to order from any of our affiliate links you help support the cost of running this blog. 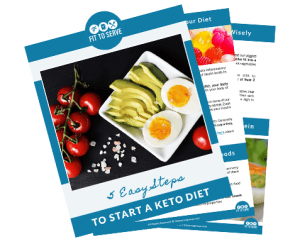 It’s my goal to always share the easiest and most delicious keto recipes with you, as well as proven tips to assist you on your low carb keto journey. Know that I am grateful for each and every affiliate order you place and thank you for your support and encouragement in advance.